One of the most prevalent problems encountered by a number of iPhone owners is on the iPhone being stuck on the #Apple logo. This problem can likewise occur to other iOS devices including the #iPhoneSE, usually after performing iOS update or system restore. When this happens, what you will see on your iPhone display is the white Apple logo with a progress bar beneath it that seems to be moving very slow or not moving at all. At first you might think that it is just normal or perhaps it just takes so long for your iPhone to load but then later on you will realize that something is actually wrong. So then you would wonder why and how to get your device back to work and run normally again. If you are reading this post, then most likely you too are facing the same problem so I encourage you to read on and get helped. This post explicates the possible reasons as to why your iPhone SE is stuck or can’t get past the Apple logo after you update iOS, restore from a backup, or erasing the device. And to assist you further, I have also highlighted a few recommended workarounds and potential solutions you can try on to get your iPhone back to normal. What could have possibly caused your iPhone SE to get stuck on the Apple logo? Your iPhone can get stuck on the Apple logo because something went wrong during the start-up process. For some reasons something has prevented your iPhone from completing its start-up routine and this is what we are going to determine. Normally, your iPhone starts up by turning on its processor, checking its memory, setting up every component and getting them ready to carry out certain task like running apps or other processes based on your input requests. All these start-up procedures are automatically happening in the background as your device shows the Apple logo on the screen. But then again, for some reasons the usual process is halted and your device is stuck. Why? Something must have changed in your iPhone’s start-up routine that is why it does not work anymore. Remember that your iPhone is still attempting to start up at this point. That being said, you can eliminate the possibility of an application is causing the problem. Listed below are the commonly known culprits that can put your iPhone in the same state in which it can’t get past the Apple logo screen. Jailbreaking iPhone. Your chances of facing the same problem is higher when you jailbreak your iPhone SE. For starters, jailbreaking refers to a process of removing software restrictions originally imposed by Apple on its mobile devices operating system. 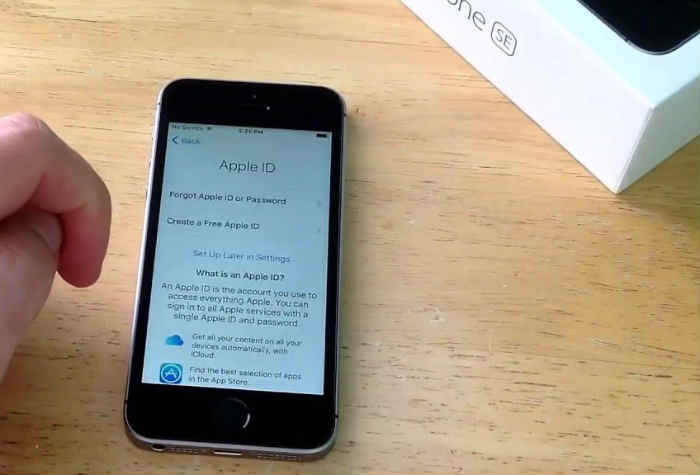 For example, jailbreaking your iPhone SE will give you root access to the iOS file system and thereby lets you download and install additional apps, extensions, and themes that are not available from the Apple App Store. Jailbreaking is perfectly legal but not recommended. Why? Because while it has entails promising benefits to the user, there are also some cons from doing so. And your iPhone being stuck on the Apple logo is one of them. Performing iOS update/restore. Software updates are rolled out to ensure system optimization in certain devices thus they are released periodically. Aside from software enhancements and new features, Apple is also releasing software updates containing bug fixes. This is usually done to address prior concerns raised by iOS device owners. However, some device issues tend to arise after performing an update. So what happens is that instead of getting the promising benefits from an update, what the user gets is the opposite. As what some iPhone SE owners have reported, they ended up having their iPhone stuck in Apple logo and become dysfunctional after installing an iOS update. That’s indeed a bummer given the fact that these devices aren’t cheap. Keep reading to learn what factors can possibly cause your iPhone to be stuck in the same state while performing an iOS update or system restore. File transfers. The reason why file transfer is included among the culprits is due to the main fact that some files do contain bugs itself especially when they get corrupted. Just like what happens when you copy or move files containing bugs. When these files are saved into your device, most likely your device will also become corrupted or not functioning as it should. The same thing can happen when you transfer apps or other contents that are corrupted into to your iPhone. So if your iPhone SE gets stuck in the Apple logo after transferring a file from other devices, then that is probably what’s inflicting the problem. Security software. Sometimes, security software including an anti-virus is to blame. This usually occurs when you connect your iPhone SE to a computer when performing iOS update, restore, back up or file transfers using iTunes. Security software from third-party developers installed on the computer might have hindered your iPhone from establishing proper connection with the computer. This is possible because when you connect your iPhone to a computer, the iPhone will be recognized as an internal device. Now, some security software may be set to deny permissions for any external devices including your iPhone, which then would result to your iPhone not recognized in iTunes or stuck on the Apple logo before, during, or after performing certain syncing actions. Hardware problems. This is the worst among other probable causes. There are some cases where an iPhone SE can’t get past the Apple logo simply because of a faulty hardware component. This can likely be the case if you got your iPhone dropped or wet previously and a certain component was damaged from that incident. Each of the iPhone components is assigned with specific tasks. Unfortunately, your only chance to get your iPhone fixed should this happen to your iPhone is to have it diagnosed by a technician for potential repair. And this also denotes a need for you to pay for necessary service. There are a couple of ways you can try on to fix your iPhone SE that is stuck at the Apple logo and does not boot up completely. Since we are already done tackling the possible culprits, what we should do next is to determine what has changed in your iPhone’s start-up routine and causing the device to stop working as it should. Once you have successfully identified the root cause, you may go ahead and try any of the following solutions, which you think is best applicable to your situation. While many of software-related issues in mobile devices are easily resolved by doing a hard reset, it’s not always the case when it comes to fixing an iPhone that is stuck on the Apple logo. Even so, it wouldn’t hurt to give this method a try this time. To perform a hard reset on your iPhone SE, press and hold the Power button and the Home buttons simultaneously until the Apple logo appears on the screen, then let go of both buttons. If that doesn’t do any good, then you may proceed and try other options. Your iPhone can also be in the same state when using defective USB cables and USB ports for data transfer. It is possible that the data transfer process was interfered because of the damage and therefore has corrupted your iPhone’s software. To make sure this isn’t what’s causing you this trouble, check and ensure that both the USB cable and USB port are not defective. If necessary, you can try to use a different cable or connect your iPhone to a different USB port to proceed with data transfer. If you have synced your iPhone SE to a computer and your iPhone is stuck on the Apple logo, there is a higher chance that a certain program, particularly a security tool installed in your computer is stopping the syncing process. For example, after you update, restore, or transfer contents from the computer to your iPhone using iTunes and your iPhone gets stuck on the same screen. Some security software may step in and interrupts the data transfer, thus forcing iTunes to abort the process. As a result, your iPhone is left half-updated/restored and therefore unusable. In cases like this, your iPhone would usually enter recovery mode and prompts you to Connect to iTunes but in some cases it will be stuck on the Apple logo. You might see a numeric error message when trying to sync, update, back up or restore your iPhone. Among the iTunes error codes that denotes a security software issue include iTunes Errors 4, 6, 1630–1641, 3000–3999, or 9000–9999. If by any chance you are seeing any of these error codes, check your device for any installed third-party security software and try to disable it temporarily then see what happens. Putting your iPhone in DFU mode and performing a DFU restore can also be a potential solution. It is the deepest type of restore you can perform on your iPhone. The difference between a DFU restore and the usual recovery mode restore is that with DFU your iPhone’s firmware is completely reload. Firmware refers to the programming structure that controls your iPhone’s hardware functions. In this process, your computer will erase and reload every bit of code that controls your iPhone’s software and hardware components. While a DFU restore stands a higher chance of fixing problems like this, it can also damage your iPhone in any way especially if your device is water-damaged. It is but possible that certain components of the iPhone had been damaged from water exposure and that has prevented the restore from completing. If a DFU restore fails because of water damage, what was supposed to be a minor problem can become worst and so your useable iPhone can become completely useless. Connect your iPhone SE into your computer. On your computer, open iTunes. Your iPhone can be turned on or off. Press and hold the Power (Sleep/Wake) button and Home button simultaneously for 8 seconds. Release the Home button when you see that iTunes screen. At this point you should see your iPhone’s screen turns completely black. This means that you have successfully entered DFU mode. If it’s not, then you have to go back from the very first step. Continue with iTunes restore using iTunes. Once the restore process completes, your iPhone should reboot and hopefully without any more issues. You can also try using alternative tools like Tenorshare’s Reiboot software to force your iPhone SE into and out of recovery mode. Although there is no guarantee that these tools work a hundred per cent, it wouldn’t hurt if you’d give them a try and see what they can do in dealing with this issue. These tools can be downloaded and installed to your computer (Mac or Windows). So all you need to do is connect your iPhone SE to your computer, open the software and then click to select your preferred option including Enter recovery mode, Exit recovery mode and Fix All iOS stuck errors. These tools are usually designed to perform recovery mode restores without losing any data from your device. If none of these suggested methods have worked and your iPhone SE is still stuck on the Apple logo, then it’s time to get help from a technician. Now that you’ve reached this point, there is a higher chance that your iPhone is suffering from some sorts of hardware damage and therefore requires repair. You may contact Apple Support if you opt for Apple repair or look for a less-expensive service center that does quality work. In order to get the iPhone out of the Apple logo loop, you also can try RecoveryTool Fix Recovery.